Popcorn is roasted with butter and a blend of spices to make an addictive snack. I make this for watching movies or even sports. Preheat the oven to 350 degrees F (175 degrees C). 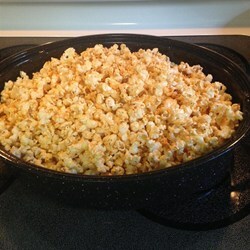 Place the popped popcorn in a large roasting pan. In a small bowl, stir together the melted butter, paprika, lemon pepper, salt, garlic powder, onion powder, and cayenne pepper. Pour over the popcorn and stir until it is somewhat evenly coated. Bake for 15 minutes, stirring every 5 minutes. Remove from the oven and cool completely. Serve immediately, or store in an airtight container for later.